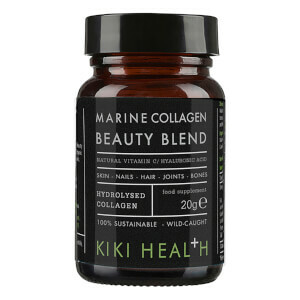 Discover the benefits of Marine Collagen Beauty Blend Powder from KIKI Health; a brand that sources pure, high quality ingredients to promote optimum health and well-being. The Marine Collagen Beauty Blend Powder is made from 100% purified Hydrolysed Collagen, extracted from sustainably sourced wild fish off the coast of France by a responsible MSC certified fishery. 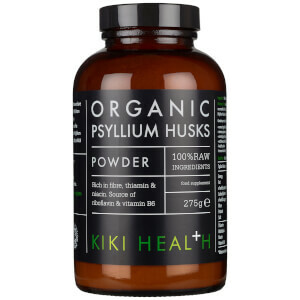 Supercharged with Hyaluronic Acid and natural Vitamin C derived from Organic Camu Camu Powder, the food supplement helps to increase collagen (the most abundant protein in the human body), which depletes during the ageing process. The powder contributes to the maintenance of healthy skin, nails, hair, bones and joints, whilst protecting cells from oxidative stress and supporting the natural immune system. Its Collagen Polypeptides are fully digestible and gentle on the gut due to their low molecular weight. Add to water, smoothie or juice. Naturally free from wheat, gluten, lactose and dairy. Adult intake should begin with 2 heaped teaspoons (10g) daily, according to your personal and lifestyle needs. Store in a cool, dry place away from direct sunlight. Refrigeration is not required. Keep out of reach of children. Please Note: If you are pregnant, nursing, have a medical condition or are currently taking medication seek advice from a health professional before you take any dietary supplement. Hydrolysed Marine Collagen (Fish), Organic Acai Powder, Organic Camu Camu Powder, Hyaluronic Acid. This product was created in premises that may contain crustaceans and products thereof and Molluscs and products thereof.